Maybe it’s the use of 80’s song “Saved by Zero” by The Fixx? 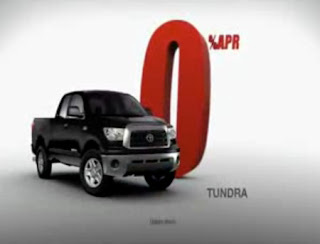 Or perhaps it’s just that no matter what program you watched, on whatever channel you had on, whatever station on your radio too, you were bound to catch Toyota’s national sales promotion to get 0% financing in one of the worst auto slumps and the first time Toyota recorded an operating loss. Apparently you are not alone if you had enough of this ad. It even gathered some negative sentiment when a Facebook group started called "Stop Playing Toyota's 'Saved by Zero' Commercial" recruited almost 10,000 members. It’s official now the WSJ and AdFreak.com voted it one of the worst ads of 2008. Really? The worst? Sure it was lame and the link between 0% financing and “Saved by Zero” wasn’t the most ingenious connection ever. But is it the worst because of the song choice or the message? It was the relentless buying spree that Toyota went on to promote the offer. The problem was over saturation. Toyota could’ve handled this issue by coming up with a variety of ads for their 0% financing campaign. Rotating ads with different messages could’ve also appealed to different consumers. I’m not sure “Saved by” is the right language too at this perilous time. The message implies Toyota is reaching out to help people by having them buy a new car with no financing charges. Good luck. The problem right now is too much debt and people are for the first time in years reducing their debt load. It is a brutal time to sell cars. Unfortunately, the entire backlash around heavy consumer spending in prior years, macroeconomic stress, and most people concerned with just keeping what they already have, all caused Toyota a bit of negative press when they bought a ton of airtime promoting “Saved by Zero.” Unfortunately, they’ll be playing “Red Skies” at their upcoming shareholder meeting. Someone spoofed Saved By Zero.